We’re at Randolph Central School talking to Shawn Huntington, the Head Coach of the Girls’ Basketball Team. They just finished a very successful year. They went 21-4, just losing at the NYS Championship Class C playoffs. The score was 42-43. Mark: Shawn, we’d like to get a little synopsis of how your year went. How many girls do you have on the team this year? Coach Shawn: We have 11 girls, 3 seniors. It’s probably one of the largest teams I’ve had in awhile. It’s a good mixture of age groups and abilities so it was good. Mark: How long have you been coaching? Coach: This is my 7th season as the varsity coach. I did coach the JV team prior to that for four years. So I’ve been coaching for more than ten years. Robin Maycock is our AD. She has been my JV coach ever since I’ve been the Varsity Coach. During volleyball we flip flop. She’s the varsity coach and I’m the JV coach. We work very well together. We bounce ideas off of each other. We have the same philosophy. So that makes it seamless when the younger players get brought up. I value what she has to offer and it’s nice being able to work with someone you trust and is 100% behind you. Mark: When the year first started, what did you expect out of them? Coach: I knew we were going to be decent. Four of the five starters were volleyball players and I’m the coach for the JV volleyball team. We actually went to the State Tournament in volleyball too. That extended the volleyball season, which overlapped with basketball. So we got a late start to the basketball season. Our first opponent was a nonleague game against Southwestern. I knew they were going to have a good year this year and they have some really tough girls that we had to try to defend. We played them at home and won. That was a moment that proved to me that we’re going to have a chance to do something really good this year. Mark: The season starts in November and you were lucky enough to play in March. That’s great! The tallest girls on your squad are 5’11”, what kind of offense did you run? Coach: We’re an up-tempo team. We don’t have a lot of size, but the girls that I do have can run the floor very well. My philosophy is always to get down the court and score the layup before the defense even thinks about setting up. Keep it simple. We have offensive set plays but a lot of the stuff is going off of their knowledge of the game and abilities to make plays when they need to. So, we don’t run a specific offense we just run the floor first and then look at what our next option is. Mark: When did you lose your first game? How did the girls bounce back? Coach: We lost to Portville in our first league game. We were away and it was a very tough gym to play in. We could have played much better. It was uncharacteristic of my returning players. So I didn’t think too much about it. I kind of went with the idea that it’s just a game. Just do your best. You’ll get a second chance at it most times. We actually saw them again in a Christmas-Time Tournament and beat them for the championship, had them again in league play, and also in the playoffs. So we saw them 4 times and ended up beating them the last 3 times. So we improved along the way. Mark: What do you do as a coach to improve the girls’ basketball skills and make them better players? Coach: The biggest thing with girls is keeping them focused. Trying to keep them cool and not worried about being down. I would never coach anyone but girls because they are the hardest workers, they’re not know-it-alls, and it seems like they would run through a wall for you. It’s just keeping them positive and working together. Never give up. I love being the underdog. I instill in the idea that you never know what can happen. Nothing is for sure. I think we took that philosophy when we played teams that we knew we should beat and we also took that philosophy with teams we knew we had to play well. We didn’t overlook any team. We knew we had to play well no matter who we were playing. Mark: When you went to Hudson Valley, you saw the best of the best of the other sections. How do you compare them with the teams in our area? Coach: They were a little better up there. In the first game, the score made it look like we handled them very well. But you have to remember that you’re playing the best basketball there that you’ve ever played. It’s a different atmosphere. The girls play harder when they know what’s at stake. When you’re playing in a State Tournament, you don’t have time to worry about playing bad. It’s all about doing what you can. The first game we played there was against Little Falls. That was a team that was going with a lot of momentum. They only had 7 girls but had beaten some big tough schools in Section 3. So the teams there were definitely good. There weren’t any when you got to say “Oh I’m glad we got this one first.” Some of the scores may have made it look like that but it was always a tough match. The competition there was nothing like here. I will say that the teams here always play us tough and want to beat Randolph. So I think that prepared us to be ready for the high stakes game up there. Mark: What do you think the girls got out of this year? Coach: I think it was just an unbelievable experience for them. At the beginning of the season they might have said “Oh let’s make it to States” as a joke. Section 6 hasn’t gone to States since 1992 and Randolph hasn’t made it to States since 1987 that. So I think actually doing it is something we’ll always remember. I know the outcome wasn’t what they wanted but to be within 1 point of the State Championship is something they’ll always remember. There were 200 other teams that wished they had been 1 of the 2 teams playing that day and we were lucky enough to be one of them. Mark: What did you take away from the experience of coaching this team and being in the Tournament? Coach: I can’t even put it into words. Just to see the excitement on their faces, to see the sadness on their faces, it makes you push hard. I won’t forget it. I hope I can spread this to the next group and the next group after that about what an experience this is. It’s nice because I have a lot of returning players that actually did participate in this event. I think that will help drive them to try to get there again. I had 3 managers from Elementary School who went to all the games. I got to see a clip of the last shot and you can see those 3 little kids standing up and getting ready to cheer when that shot was just short. The disappointment that they had on their faces when the shot didn’t go in, I’m glad they were there because they’ll always remember the thrill of it. It’s important to get them excited and involved as early as possible. Mark: I see you have a group coming up with eight returning players. Coach: Yeah, I lose some good seniors. Marah Maycock is by far the best player in my mind in the area. She’s second all-time scorer in Section 6. Her younger sister McKenna Maycock is only a freshman and she’s already passed her thousandth point. She’s very hard to guard and she’s going to give a lot of teams around here fits for three more years. When you have a player like that it’s really neat. I’m very lucky that I’m not coaching against her because I wouldn’t want to do that. Mark: Anything you want to tell the community or the girls about your year? Coach: I just want to thank the community for supporting us through the whole run. Every game that we played in the playoffs we were definitely outnumbered fan-wise, but that didn’t bother us. We had some consistent community followers that were really awesome. To the girls, thank you for all you’ve done. Some of them have played for me for 6 years. It’s hard to say goodbye to those players who you’ve been working with for so long. It’s calming to me knowing that they all will succeed in life. They are smart girls and work hard at what they do. 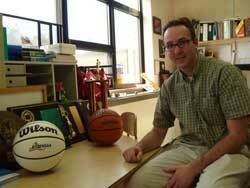 Mark: Randolph Girls Basketball program will be in good hands for many years to come. The excitement of playing in the State Champion Tournament will be an inspiration for the girls to keep working hard and to get themselves there again next year. Thank you Coach Shawn for taking the time to talk to the Jamestown Gazette.